Q: Is the dosage of BuchuLife Soft Gel Capsules meal dependent? A: No, you can take the capsules irrespective of whether it coincides with a meal. 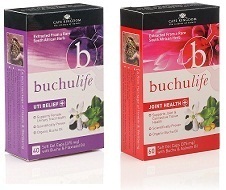 Q: Are there any side effects associated BuchuLife Soft Gel Capsules? A: No, the product is a natural product yielding no side effects. Q: Can BuchuLife Soft Gel Capsules be taken in conjunction with other medicines? A: Yes, Buchulife products do not interact with other medication. Q: Can BuchuLife Topical Gel be safely used for children? A: Yes, Buchulife First Aid Gel is a natural product, safe for use on babies and children and yield no side effects. 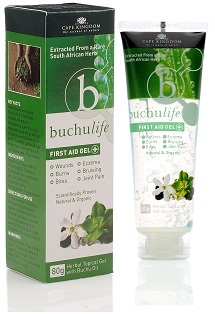 Q: Can BuchuLife Topical Gel be applied for ailments such as for the control of eczema, ringworm, sunburn etc? A: Absolutley! Due to the anti-inflammatory, antiseptic and antifungal properties of Buchulife First Aid Gel, it is applicable to these conditions. Q: Can BuchuLife Topical Gel be used to alleviate muscle pain / injury? A: Yes, due to the potent anti-inflammatory properties of Buchu, Buchulife First Aid Gel is an excellend product to use for muscle and joint pain and injuries. 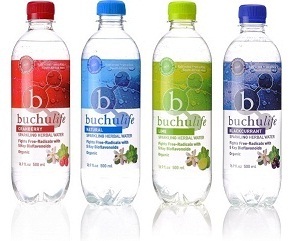 Q: Is it safe for children to drink BuchuLife Herbal Water? A: Yes, Buchulifef Herbal Waters are an excellent healthy and innovative alternative to introduce to children. Q: Why is BuchuLife Herbal Water so healthy? A: It contains a host of Bioflavonoids, Antioxidants and Vitamins needed by the body to combat free-radicals and enhance general wellbeing. Q: Should BuchuLife Herbal Water be refrigerated? A: For best refreshing tast, keep refrigerated.